Here are a pair of Irish crocheted cuffs. I think they are Victorian, but they may be Edwardian. I should know my fashion history better. They are finely sewn to some soft netting. There is a matching collar, but that is still sewn to my wedding dress. I wore these with my wedding dress which was the same style as Princess Di’s. In fact I copied my dress from a picture in Vogue that I had saved. 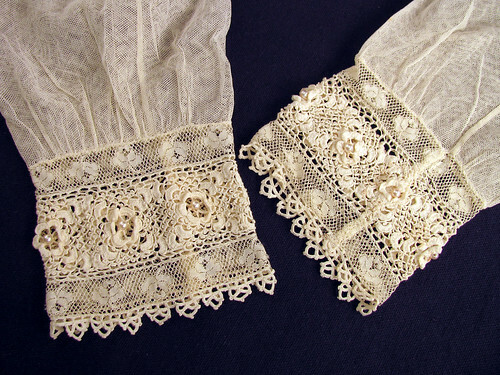 I really like the idea of adding crochet lace to manufactured lace. The pointed edge trim is crocheted too. Seeing how these cuffs are constructed opens up the feasibility of adding an insertion of pre-made lace to a hand crocheted item. Something to think about anyway. This entry was posted on Sunday, March 8th, 2009 at 5:54 pm and is filed under Crochet and Lace. Tagged: Crochet, Lace. You can feed this entry. You can leave a response, or trackback from your own site.